Over the last two months since our previous Syria war map, fighting increased in three different corners of the country. In the northwest, rebels pushed farther into the coastal province of Latakia, a stronghold of President Bashar al-Assad and his native Alawite ethnic group. The rebel forces captured and briefly held several Alawite villages in the mountains before being pushed back to their base in Salma. Meanwhile, fighting has heated up in the already contested Daraa province of southwestern Syria. Most notably, the rebels stormed the major town of Nawa in July, before losing it to the Syrian army again this month. In the country's opposite corner, the far northeastern province of Hasakah, Kurdish militias finally seized full control of Serekani (Arabic name: Ras al-Ayn) from religious extremist rebels who had been fighting for the town since last year. Apparently in response, the extremists have pushed farther into Kurdish territory elsewhere in the province. Syria's three largest cities have remained battlefields over the past months, with number-one metropolis Aleppo still bitterly divided between the government, the rebels, and Kurdish groups. 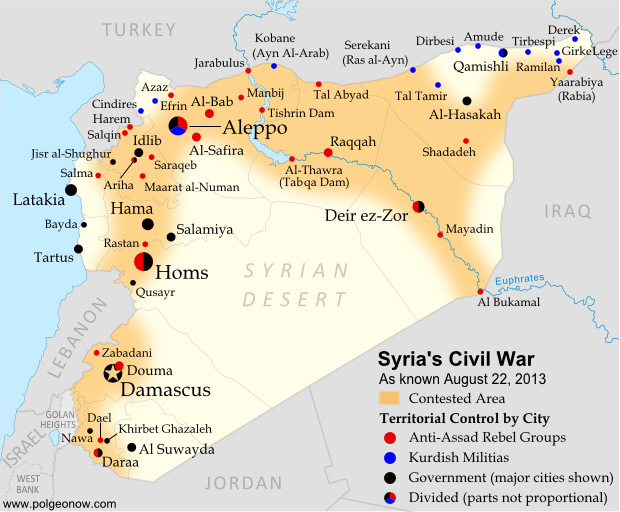 The Syrian army has made further inroads into Homs, and now controls most but not all of the key central city. While central Damascus remains mostly out of reach for the rebels, fierce battles have continued to be waged over the capital city's many suburbs (see a map of rebel and government control in the city from two weeks ago). An expert quoted in a New York Times article last month estimated that Syria's rebel groups now control 60-70% of the country's land, but only 40% of the population, due to their greater success at controlling rural areas than holding major cities. Meanwhile, the opposition remains as disorganized as ever, having proved unable to form a national-level interim government for the rebel-held areas. But the starkest sign of disunity between the various anti-Assad groups has been the breakout of major fighting between the secular-minded Free Syrian Army (FSA) rebels and the religious extremists of the Nusra Front and the ISIS ("Islamic State of Iraq and Syria"). The latter groups have emerged as the strongest rebel force in many areas of Syria, driving the FSA out of Raqqah city as part of their rise in power across the country's north and east. This edition of the map returns to showing Ariha, a major town in Syria's northwestern province of Idlib whose status had been unclear for many months. Recent reports indicate that it is divided between rebel and government control. In central Syria, the war has now reached the previously peaceful city of Salamiya, which was shelled by rebel forces two weeks ago.